(SPACE.com) When Neil Armstrong, the first person to walk on the moon, died Saturday (Aug. 25), it marked the passing of an American icon and one of only a handful of men to stand on the moon and look up at Earth. Armstrong died of complications related to recent surgery at age 82, though his legacy as commander of NASA's historic Apollo 11 moon landing is cemented in history. But Armstrong wasn't the only emissary from Earth to walk on the moon. 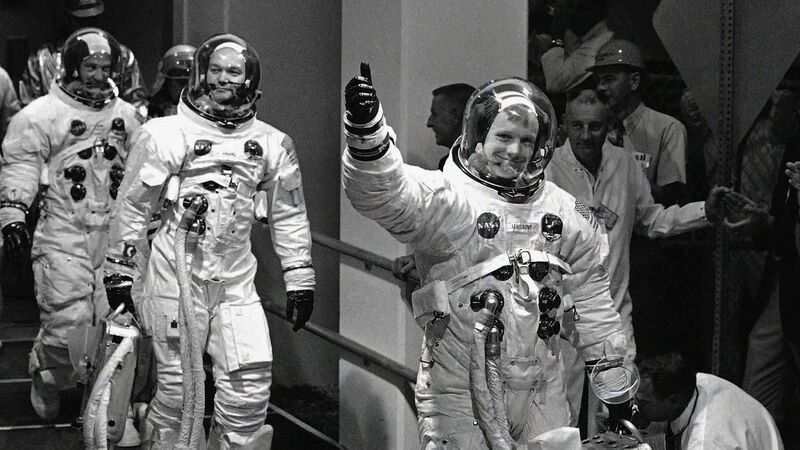 The Apollo 11 crew (left to right): Neil Armstrong, Michael Collins and Edwin "Buzz" Aldrin. Buzz Aldrin: Lunar module pilot for Apollo 11. A U.S Air Force pilot before joining NASA in 1963, Aldrin first launched into space on the Gemini 12 mission in 1966 to test spacewalking procedures, including new restraints attached to the outside of the space capsule, and new training techniques. After becoming the second man to walk on the moon, Aldrin resigned from NASA in July 1971. Post-NASA, he has authored numerous books, given lectures around the world, and even participated in the reality television show "Dancing With the Stars." Aldrin is currently the president of Starcraft Enterprise, a company he founded to promote his vision for the future of space exploration. Michael Collins: Command module pilot on Apollo 11. Collins stayed on the Columbia command module while Armstrong and Aldrin took the Eagle lunar lander down to the moon's surface. Apollo 11 was Collins' second spaceflight, after the Gemini 10 mission in 1966. On that flight, Collins served as pilot during a successful rendezvous and docking with a separately launched unmanned spacecraft called Agena. Before joining NASA in 1963, Collins was an experimental flight test officer in the U.S. Air Force, logging approximately 5,000 hours flying time. He retired as a brigadier general from the Air Force, and left NASA in 1970 to work for the U.S. State Department, and then to become the director of the Smithsonian's National Air & Space Museum. In 1980, Collins left the Smithsonian, joining the LTV Aerospace company, and then started his own consulting firm in 1985. He has authored several books and paints watercolors. Charles "Pete" Conrad: Commander, Apollo 12. Conrad headed up the second lunar landing mission, Apollo 12, in November 1969. Conrad became the third person to walk on the moon, and spent more than a day exploring the lunar surface. Apollo 12 was Conrad's third spaceflight, following his turns on the Gemini 5 and Gemini 11 missions. A test pilot for the U.S. Navy, Conrad joined NASA in 1962, and retired in 1973 after commanding the Skylab 2 mission on the first American space station. After his military and NASA career, Conrad worked at the American Television and Communications Corporation (ATC) and the McDonnell Douglas Corporation. He died in 1999, following a motorcycle accident in Ojai, Calif.
Alan Bean: Lunar Module Pilot, Apollo 12. Bean's first spaceflight was Apollo 12, during which he spent more than a day on the surface of the moon with Pete Conrad. A captain the U.S. Navy, Bean joined NASA in 1963, and followed up Apollo 12 as commander of the Skylab 3 mission in 1973. He retired from NASA in 1981 to concentrate on painting, saying he was inspired to communicate his space experiences through art. Edgar Mitchell: Lunar Module Pilot, Apollo 14. Mitchell's first flight to space on Apollo 14 sent him to the moon with Alan Shepard for a total of 216 hours and 42 minutes in space. The U.S. Navy captain retired from NASA and the Navy after that mission in 1972, going on to found the Institute of Noetic Sciences, dedicated to the study of consciousness. He has written books on mystical experiences and psychic exploration. Stuart Roosa: Command Module Pilot, Apollo 14. On his first and only trip to space, Roosa piloted the command module Kittyhawk, making observations of the moon from orbit while Shepard and Mitchell walked on the lunar surface. Roosa joined NASA in 1966 from the U.S. Air Force, and worked on the space shuttle program after the Apollo flights ended. After his retirement from NASA in 1976, Roosa then worked for U.S. Industries, Inc., for a commercial real estate firm called Charles Kenneth Campbell Investments, and was president and owner of Gulf Coast Coors, Inc., a beer distributor. Roosa died in 1994, due to complications of pancreatitis. James Irwin: Lunar Module Pilot, Apollo 15. Irwin's first and only flight to space was on Apollo 15, during which he walked around the moon's Hadley Rille and Apennine Mountains, collecting 171 pounds of moon rocks with Scott. Irwin, a retired colonel in the U.S. Air Force, joined NASA in 1966. He left the space agency after his Apollo 15 flight in 1972, to become a preacher, and formed a religious organization called High Flight Foundation in Colorado Springs, Colo. Irwin died in 1991 of a heart attack. Alfred Worden: Command Module Pilot, Apollo 15. As a test pilot, Worden was selected as an astronaut by NASA in 1966. He piloted Apollo 15's command module Endeavour whiel Scott and Irwin walked on the moon's surface. Following his space flight, Worden worked as a scientist at NASA's Ames Research Center in California, and ultimately retired from NASA in 1975. He went on to work at Maris Worden Aerospace, Inc., and BG Goodrich Aerospace. John W. Young: Commander, Apollo 16. Young led the fifth manned moon landing mission, Apollo 16, in April 1972, when he and Charlie Duke explored the lunar highlands at Descartes, collected 200 pounds of moon rocks, and drove more than 16 miles in the lunar rover. Young joined NASA in 1962 as a pilot in the U.S. Navy, and flew on six separate space missions. He flew on the first manned Gemini mission, Gemini 3, in 1965, and then on the Gemini 10 mission in 1966. Young then served as Command Module pilot of Apollo 10, which orbited the moon in 1969, but did not land. Following the Apollo program, Young went on to fly on two space shuttle missions, STS-1 -- the first ever space shuttle flight in 1981 -- and STS-9 in 1983. Overall, Young logged 835 hours in space, and worked at NASA until retiring in 2004. Charles Duke: Lunar Module Pilot, Apollo 16. A retired brigadier general in the U.S. Air Force, Charlie Duke joined NASA in 1966 and flew on one space mission, Apollo 16, before retiring from NASA in 1975. During the Apollo 16 mission, Duke and Young deployed a cosmic ray detector and an ultraviolet camera on the lunar surface. After NASA, Duke pursued business opportunities, founding the Duke Investments Charlie Duke Enterprises firms. He is also president of the Duke Ministry for Christ. Thomas "Ken" Mattingly: Command Module Pilot, Apollo 16. Mattingly joined NASA in 1966 and was due to make his first flight to space on the Apollo 13 mission , but was removed from the crew 72 hours before launch because he had been exposed to the German measles. Mattingly was reassigned to the Apollo 16 mission. Mattingly piloted the Command Module Capser, working on photographic and geochemical mapping of a belt around the lunar equator. Following Apollo 16, Mattingly flew on two space shuttle flights, STS-4 and STS-51C, before retiring from NASA in 1985. Eugene Cernan: Commander, Apollo 17. Cernan had made two flights to space -- on Gemini 9 in 1966 and on Apollo 10 in 1969 -- before leading the sixth and last lunar landing mission, Apollo 17, in December 1972. This excursion to the moon marked the longest lunar landing flight, with Cernan and Harrison Schmitt spending more than three days on the moon's surface. Cernan was the last man to leave his footprints on the surface of the moon. A captain in the U.S. Navy, he retired from NASA and the military in 1975. He worked at Coral Petroleum, Inc., and then founded his own consulting company, the Cernan Corporation. He also served as Chairman of the Board of Johnson Engineering Corporation, which has helped NASA design trainers and equipment for space exploration. Harrison Schmitt: Lunar Module Pilot, Apollo 17. Schmitt, a trained geologist, was the only astronaut without military experience to walk on the moon, and helped train all Apollo moon-walking crews in geology. He was selected by NASA as a scientist-astronaut in 1965. Apollo 17 was Schmitt's only flight to space, but he continued to work at NASA after the Apollo program as chief of the scientist-astronauts and then as NASA Assistant Administrator for Energy Programs. In 1975, Schmitt resigned from NASA to run for election in the U.S. Senate in the state of New Mexico, where he won as a Republican and served a six-year term. Ronald Evans: Command Module Pilot, Apollo 17. While Cernan and Schmitt walked on the lunar surface, Evans stayed in lunar orbit aboard the Command Module America. During that time, he completed a spacewalk to retrieve three camera cassettes and make an inspection of the capsule's equipment bay area. He still holds the record of more time spent in lunar orbit than anyone else in the world. Evans became an astronaut in 1966. In 1976, he retired as a captain in the U.S. Navy, but stayed on at NASA working on the space shuttle program in the operations and training group and within the astronaut office. He retired from NASA in 1977 to work as an executive in the coal industry. Evans died in 1990 of a heart attack.